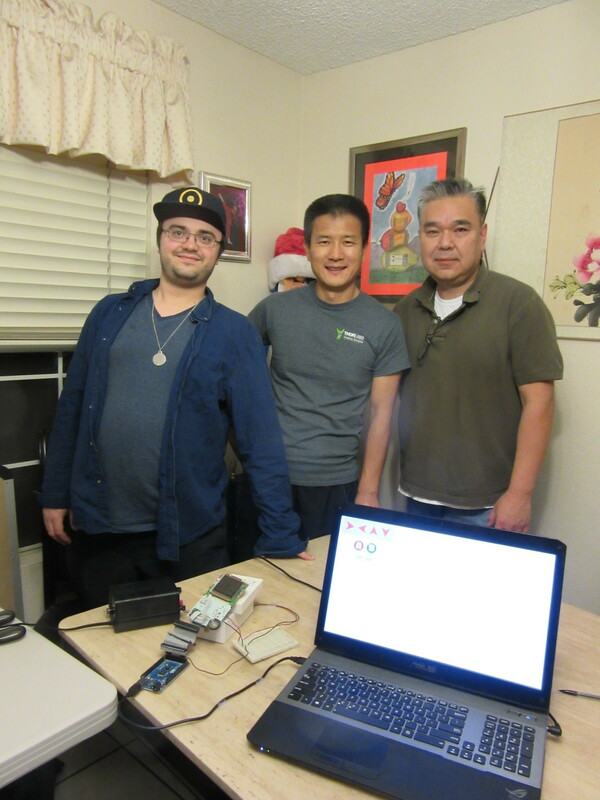 Two of my friends at 21st Century Medicine, Tan and Limdo, were interested in learning how to to do hardware and software hacking, so recently we've been getting together on the weekends and working on some simple electronics and coding projects. It's generally a relaxing time, and we always enjoy good food and lots of tea! Hardware – soldering resistors, LEDs, etc. We lay out the basic circuit design and then actually build it in reality! This part ends with a set of wires that we can attach to the Arduino. Arduino microcode – We program a simple interface to the wires we just assembled and make the hardware we just built do something. Then we define an API to drive the Arduino via the serial port. Control Scripts – Here we use python, perl, or whatever's appropriate to make a better API to our Hardware/Arduino. Web Control – We build wrappers to the control scripts and use them as CGI programs to build a nice web interface to our hardware. The purpose of doing a few projects in this style is that even though these projects are simple, they contain in minature all the things one needs to develop real products – from managing sensors and effectors to building a touch-screen interface using a raspberry pi, html, css, and a local web server. I spent a wonderful Saturday shopping for teaching supplies and bought a couple prototyping boards, a bunch of resistors, LEDs, some op-amps, potentiometers, wires, some photoresistors, a soldering iorn; basically everything we'd need to have fun! I showed Tan how to wire up an LED and how voltage dividers worked, and then he designed and built a nice numeric display like you might find on a microwave! The LED Display cycles through each digit. The code is not very compressed, and is hopefully a little clearer as a result. One interesting thing to note is how we determined the constants in the set_display function. We plugged the wires into the Arduino in whatever way was most physically convienent, then activated each pin in turn while writing down which led they activated. This allowed us to "untwist" all the inputs in one step, and is equivalent to multiplying an identity matrix into an unknown transposition matrix, then calculating its inverse. Making this thing web controlled is actually pretty easy! This modified program constantaly polls its serial port and then displays an LED pattern that corresponds with the ASCII representation of the serial port input. So you can send the character "8" down the serial port and the Arduino will activate all of its LEDs. Sending things down the serial port is extremely easy in python. Here's the "magic" CGI script that serves as a bridge between the webserver and the python control script. Note that it does error checking on its inputs since they could be literally anything because they're coming from random web users. Now for the website part. It will use extremely simple POST commands to drive the perl script. With only a few extra lines of code, the Arduino gets a web interface! After our success the first weekend, we decided to do something a little more complicated the next weekend! The grand idea is to make a gameboy that can be remotely controlled over the web, where people can submit speedruns and then get back a video which console-verifies their speedrun. For this weekend however, we wanted to focus on controlling the gameboy's buttons manually via a web interface that would work with a touchscreen. This project is a little more complicated than last project because we had more complicated physical hardware stuff to do, and we wanted to make a nicer-looking web interface than last time. 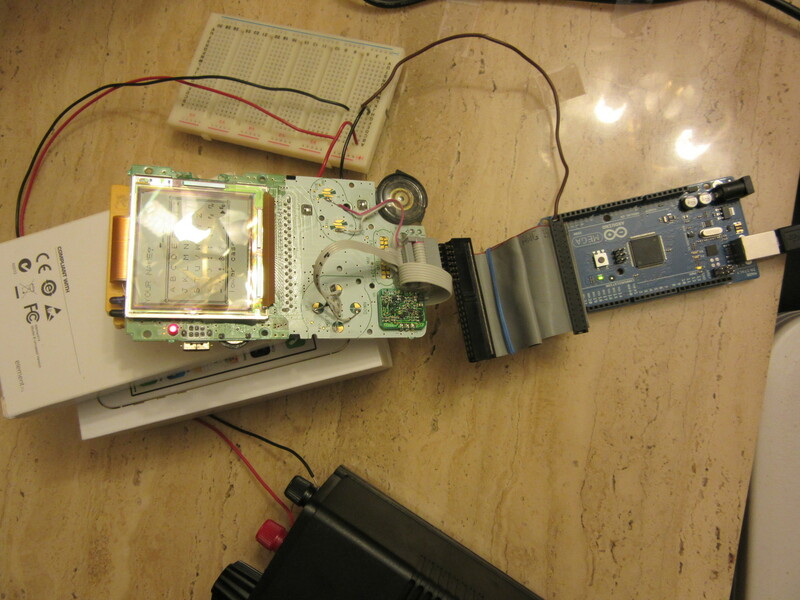 First up is taking the gameboy apart and powering it with our voltage source rather than with batteries. With a little soldering, we can power the gameboy without batteries. We can also control the buttons using a simple wire probe. We use a voltage probe and some experimenting to control the buttons by grounding the high voltage side of the buttons. The next step is quite nervewracking and requires a steady hand: we have to solder wires onto each of the tiny button pads! I did the D-Pad, and Tan took care of the rest of the buttons. I think that he did a really good job! All the buttons still work after our soldering job. 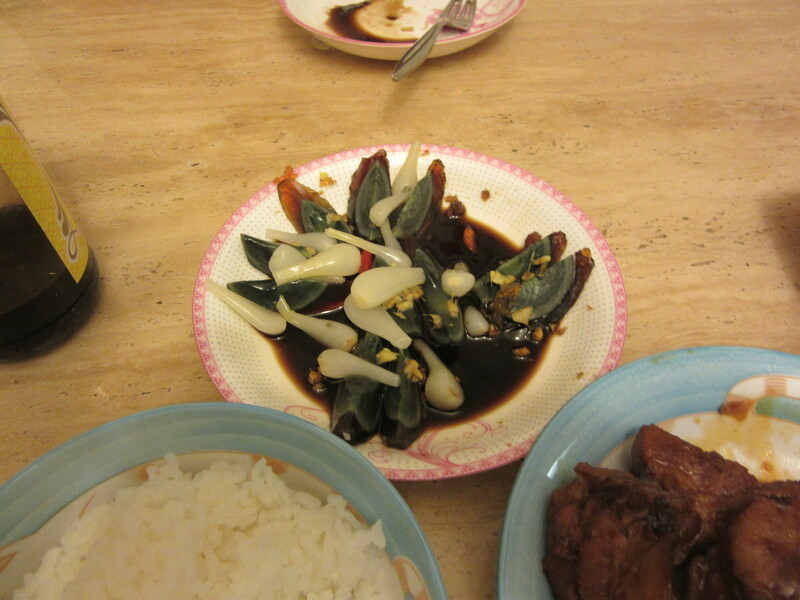 Figure 1: We took some time out to eat these excellent thousand year eggs, along with a lot of other wonderful things! With the hardware interface done, we then created some Arduino microcode that was very similar to what we had done last weekend: a serial interface controling digital output pins. // We use low voltage to "press" a gameboy button. // Opens serial port, sets data rate to 9600 bits per second. // button codes. No error checking is performed. This code is simpler than the LED code because we only support serial communication, and because we are only activating one pin at a time. Like last time, we also made a simple python program to talk to the Arduino. This time we put the error checking in our python script. With this CLI, we can test that everything works. Now that everything works, we can build a nice web interface to control the gameboy. We start with a CGI script that uses our button API to control the gameboy. Next comes the html which will define the structure of our interface. You can visit this page here. Tan controlls the gameboy with his phone's touchscreen! We managed to put together a radio controlled gameboy with a touchscreen! Figure 2: The gameboy fully hooked up to everything. Figure 3: We had a fun time!